Home » Posts Tagged "description"
With SEO content being a very important subject the words “Content is King” is a statement that I use a lot. SEO Content is one of the most important SEO areas, websites that use relevant well written content will be ranked higher than sites that use little, poorly written content. In this article I am going to contradict myself so please forgive me. The correct way to use content on your website. Make sure that you use the keywords for your target search term. Make useful content for your target audience. Flesch reading score is a great tool for content. This is available in office and outlook (instructions here) also I am sure if you search you will find some useful sites. It will score your readability out of 100 points, The higher the score, the easier it is to understand the document. For most standard files, you want the score to be between 60 and 70, this is the score that will mean most 11 year olds wiil be able to read with ease. 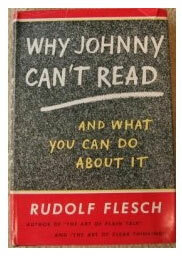 This article has a score of 74.9 in the Flesch Reading Ease Test. For information based websites this is easily achievable but for E commerce Sites this is very difficult to do. Lets imagine that you sell hats, how many times can you really describe in 300 words a hat on each page of your website with useful individual content for SEO. Acheiving the content for SEO for E commerce. There are two main approaches to dealing with this issue, the first is to create landing pages of useful content optimised for SEO but not stuffed with keywords for the sake of it. A good example a of way to deal with this is to create branded landing pages. Another good solution is to have a blog set up with articles about the subject the you sell. When you have created the content pages you will need to link to your product pages from the landing page or article using anchor text which is the clickable text that users will see as a result of a link, and is placed within the anchor tag. This is an anchor tag optimised for red hats. Following the SEO (search engine optimisation) best practices outlined below will make it easier for search engines to crawl, index and understand your content. Natural or ‘Organic’ search engine results are displayed in certain areas on a search engine results page, by using good SEO techniques you can get to the top of the search engines, but not the very top as this space is reserved exclusively for the search engine themselves this is how they make money. 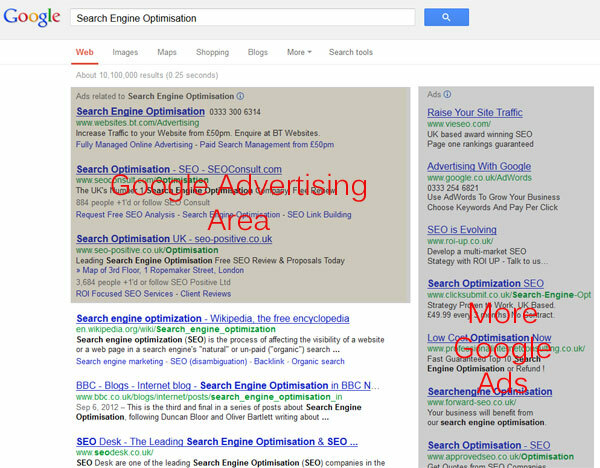 When you click on any of the greyed out areas in the image to the right you are costing someone money and lining the pockets of the search engine, in this case google. Our main target is google as they have the lions share of the Internets searches performed in the western world, The practises that I suggest will work well for all search engines. Page titles are very important to get correct, they should be accurate to the content and your target audience. Create unique Titles for each page of your website. Keep Titles to within 70 characters. People searching for a ‘red hat’ if your title is Clothing | Red Hats for you Red Hat will be bold and stand out to the person searching. Keep it simple and as descriptive as you can, if you add Hats | Cheap Red Hats | Bargin Best Hat Shop then you have mentioned hats too many times (keyword stuffing) and if you do not have the words cheap, red, bargain, best, then you are wasting words. If you run out of things to add then add your location or business name. SEO is pretty straightforward for Title tags, spend time to get them right as they hold a lot of weight with the search engines. 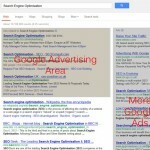 A page’s description meta tag gives search engines a summary of what the page is about. A page’s description meta tag might be a sentence or two or a short paragraph. A search engine will not always use this description that you add it might use a snippet of the wording from your page itself, but if relevant then it is more likely to be used, what it does if give a search engine the description of what the subject matter is about. In other search engines other than Google and directory’s this will be used and when people like your page from social media then it will nearly always use the description. * Importand recommended description length 155 characters.